Mancala is one of the world's oldest games, originally from Africa. Like many classic games, there are a number of variations, so players should be sure to agree on all rules ahead of time. As the second move on your turn, when going first, a good move is to play from your rightmost or second-rightmost hole. Either of these moves will drop a stone into your opponent's third hole, preventing them from making the same good opening move you just made. The rightmost hole is the preferable move because you want it empty. Empty your rightmost hole early in the game. Because your rightmost hole is directly next to your mancala zone, whenever you pick up a single stone from that hole as your move, you will immediately score a point and get another move. For this reason, emptying that hole early is a powerful strategy. 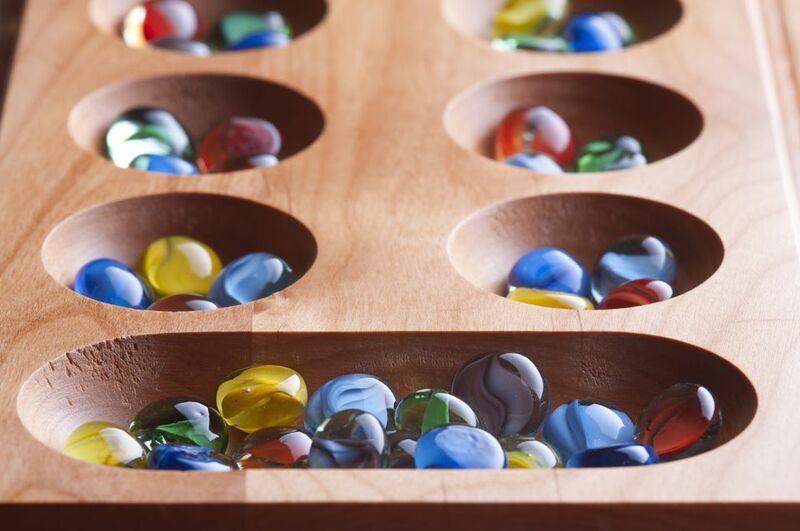 After you have emptied the hole, whenever a stone lands there, your immediate next move should be to drop that stone into your mancala zone for a free point and then move again. If playing with the capture rule, create empty holes on your side of the board. This will allow you more opportunities to capture your opponent's stones by ending a turn on one of them. Capturing a pile of stones can be very powerful. If you are playing with the capture rule, be aware of whenever the opponent has an empty hole across from a lot of your stones. If a final pebble lands there, you can lose all of those stones. You can watch out for this by counting stones in the other holes, to make sure the opponent cannot land a final pebble in that spot. If one of your holes filled with stones is threatened, your next move could either be to fill the empty hole or play the stones from your full hole as a defensive move. If you are not playing with the capture rule, a simple strategy is to pick a hole on your side of the board and never play any stones from it. If you can make your opponent run out of stones first, this assures that every stone which lands on that spot will be yours at the end of the game. Look for opportunities to score a quick mancala and then take an extra move. Unless it ruins your chance at a capture, it is often a good move to take a free point and then move again. If you always play from any hole that ends on your mancala, you will not only score lots of points and get extra moves, but you will also avoid having so many stones build up in a hole on your side that you have to play them onto your opponent's side.